The Ugly Voice begins his discussion of the outer fence of Treblinka (Episode 26 [YouTube version]) here by pointing to Arad's reference that anti-tank obstacles placed around the camp's perimteter were called "Spanish horses." Then he says that while they might stop a tank from entering the camp grounds, it would not be necessary for the tank to enter the camp to fire on the camp at point-blank range. Furthermore, says the UV, if a Soviet tank got that close to the camp, it would have been evacuated already. Notably, the UV doesn't consider that perhaps those obstacles were there not to keep a tank out, but to keep the prisoners in. When, finally, the UV gets around to considering that the antitank obstacles at Treblinka would have been used to keep people in rather than tanks out, he says that there's too much jerry-rigging of devices for the "story" to be realistic. "Would it have been so ramshackle and rigged up?" 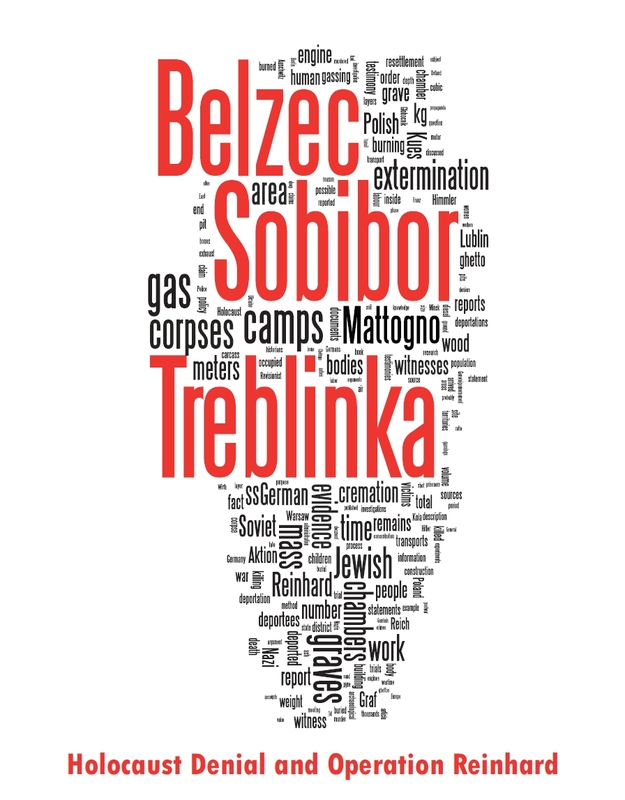 the UV asks of Treblinka. Yes, it would have been. What the UV fails to grasp is the largely ad hoc nature of the killing process in the Reinhard(t) camps. Rather than raising suspicion among the civilian populations by ordering poison gasses to known concentration camp locations or building a concrete wall around the camp, they made do with what they had around. This, in fact, is the very basis of the school of Holocaust historiography called "functionalism," of which one of two of the UV's favorite authors, Raul Hilberg, is considered a proponent of. This does tell us one other thing about the UV: He probably never read Hilberg's book, at least not in its entirety. Oh, and he probably didn't read Arad either. How do we know? The existence of the antitank trench at Belzec is actually mentioned by Arad on p. 24 of his book: "The area included antitank trenches that had been part of the border fortifications built there in 1940. This was a further advantage, as the trenches could be used as burial pits for the victims." How did the UV miss that? If he actually did read the book, he didn't miss it. In other words, he's lying by omission --- again. Now the UV tells us that, when doing a Google search on "Spanish Horses," the vast majority of the hits he gets are Web sites having to do with Treblinka. His explanation for this term, which he concludes is not a genuine term is that the original term for the antitank devices was "Czech hedgehog." This term wasn't remembered by a survivor, however, and so he came up with "Spanish horse" instead. Stop for a moment: Does that assertion seem likely to you? There is a very big mistake being made here. Perhaps we should ask ourselves why the UV did no search on the term in German? If he had searched the term "spanische Bock," and removed the term "Treblinka" from the search, he'd have quickly learned that the Spanish horse was a medieval torture device. You can see one in use in an old engraving here. But there's an even more direct reference that the UV totally missed (as did I, until Nick pointed it out to me). The Nazis used a spanischer Reiter as a anti-tank device, one of which you can see here. Doesn't that look familiar? Reiter is German for "rider," but as you can see at a popular online German-English dictionary, the connotations are overwhelmingly equestrian. Now imagine the scenario. First, remember that Arad was born in Poland, so his first language was Polish, Yiddish, or perhaps both. As a Soviet partisan during the war, he might have learned Russian or Lithuanian. (He already knew Hebrew from having belonged to a Zionist youth group.) Certainly he would have picked up German along the way. All these languages, and yet he wrote Belzec, Sobibor, Treblinka in English. What's my point here? My point is that it's quite possible that, in labeling the type of anti-tank barrier used by the Nazis at Treblinka, Arad translated the word from German to English incorrectly. After all, neither is his native language. All of this does prove one thing: If his terrible pronunciations were not already your hint, you know now that the UV probably doesn't know any German at all. Back to the film: The UV returns to lonesentry.com to look at German battlefield fortifications, showing a barbed wire fortification. He says, "Certainly they put more energy into a death camp fence." 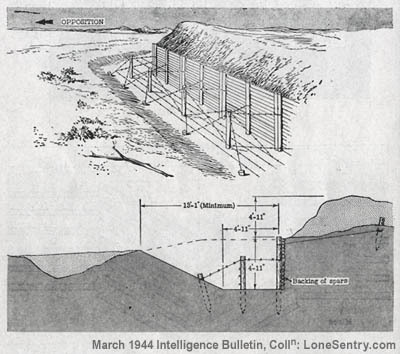 He also shows us a barbed wire enclosure shown in the March 1944 issue of the Intelligence Bulletin. (He goes to U.C.-Berkely to show us the picture, but it's actually online already, right here (the top of Figure 23 at the very bottom of the Web site.) The UV tells us that they were able to build a genuine wall around this building, and that the barbed wire was deemed sufficient enough to keep out invasion forces. But wouldn't you know that there's just one more lie by omission in this part of the UV's little project? Yes, there is. Here's what the Intelligence Bulletin has to say when referencing Figure 23: "The type of ditch illustrated in figure 23 is revetted with logs. The spoil is used to form a parapet on the German side, while the depression itself is filled with an apron-type barbed-wire fence" (emphasis mine). That's right: There's an antitank ditch around the barbed wire and the walls. But the UV didn't tell us that. Why not? And why drag us to UC-Berkeley when he could have just pointed us to the Web site? My own personal guess is that if he used the picture as it appears online, he wouldn't have been able to crop out the bottom, which clearly shows the ditch, because the picture would have been rendered too small. And if he'd tried to crop the picture and then enlarge the cropped image, he would have made the picture too faint, as it is already faint to begin with in its original form online. This is one of the UV's most blatant lies that I've personally encountered so far. Perhaps he needs a Sancho Panza to keep him honest on his quixotic quest? >>Rather than raising suspicion among the civilian populations by ordering poison gasses to known concentration camp locations or building a concrete wall around the camp, they made do with what they had around. I also thought that Gerstein was delivering poison Zyclon-B frequently without raising any suspicions. I may buy that a friendlier looking fence wouldn’t scare off the incoming people. But two fences with 40 or 50 meters of desert in-between is not exactly a welcoming sign either. What’s the point of a second fence 40 or 50 meters from the first? Maybe 5 or 10 meters of no-man’s land, but fifty? This isn’t the Korean DMZ or the Gaza-Israeli border, maybe not even there you have such a gap between fences. (I am surprised that Colonel Arad doesn’t know that). 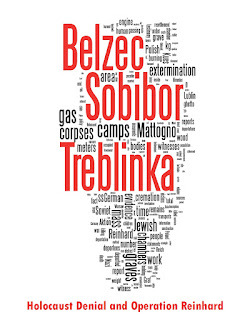 Only Treblinka needed the “DMZ” approach, not Belzec or Sobibur? Was the anti-tank obstacle fence in Treblinka also woven with fine boughs and trees? Did the Germans also built the Majdanek ‘gas chambers’ right next to the main road so they don’t raise suspicions by hiding them out of view? >Only Treblinka needed the “DMZ” approach, not Belzec or Sobibur? >Was the anti-tank obstacle fence in Treblinka also woven with fine boughs and trees? >Did the Germans also built the Majdanek ‘gas chambers’ right next to the main road so they don’t raise suspicions by hiding them out of view? Majdanek has a very complicated history. It was not designed as a killing center, and this was even more ad hoc than the other camps.